You can also paint as shown in the picture above using straight lines. Keep on practicing until you feel that your strokes are perfect. Now going to the second stage. Draw a flower on a fabric. Fix it to the frame. Now load the brush with color. Start painting the out line of the flower. Fill it with color fully. The color should be filled in a single direction using the brush (either upwards or downwards) not circularly. See that there are no gaps in-between. This method is called plain filling work. In the same manner you can draw leaves etc and fill them with color (any single color) as shown in the above pic. Take care that the color do not spread. Use very little water if necessary if the paint is too thick. The above pic. shows how to blend two colors. Draw a flower on the cloth and fix it to the frame. Now select two colors. For example I have used Red and Black in the above pic. Now take a single petal and fill half of the petal (from the top) with one color. 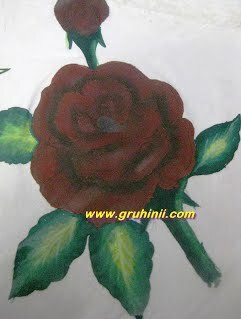 (I used red first) Use another brush and fill the bottom part of the petal with black. There should be a small gap between these two colors. Now wash the brush (or you can use another brush) clean it with a rag. Now combine both the colors gently in a single direction ( either up or down ) Remember the colors should not be dried when you are blending them. you can dip the brush in plain water if necessary to combine the colors. Use very little water and take care that it does not spread. After finishing one petal move on to another petal and try to fill in the same manner. You can even draw and fill the leaves too. You can combine green color with lemon yellow. Draw a design on the fabric and fix it to the frame. Load the brush with a single color and spread the brush. 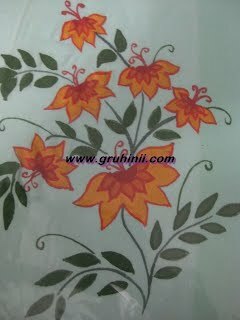 (do not add water to the color) Now fill each petal with gentle strokes. I saw this video in you tube and I think this will help you to understand easily and you can start painting.